나트랑, 베트남의 에델레 호텔 | 호스텔월드에서 예약하세요. 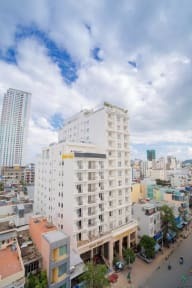 The hotel is located extremely convenient location, Nha Trang Bay from approximately 500m west central neighborhood full of lively nightlife. From the hotel you can see the majestic beauty of Nha Trang Bay, one of the world's 29 most beautiful bay recognized by UNESCO. 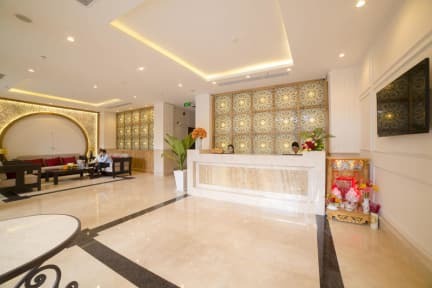 Moreover, the hotel is located in downtown Nha Trang, Qui very convenient for choosing the service using the service: from shopping, tours, coffee shops, beauty salons, banks, nightclub. With 98 guest rooms, a rich and diverse types of rooms, especially our senior class bedroom reserved for VIP guests and family rooms are equipped with reasonable price. - The class system and diverse types of accommodation, to suit each of your guests needs. - The camera system installed anywhere in the hotel to ensure security for customers. - All rooms have bath design. - Bathroom Amenities, used free. - Equip safe in all bedrooms. - Connect high-speed Wi-Fi Internet free of charge. - Dressing table and work. - Minibar and complimentary drinking water daily. - 50m square of swimming pool and fitness room and bar located on the 10th floor. - The restaurant can accommodate 180 guests at the 2nd floor. 6. All children are welcome. - Child under 5 years of age stays free of charge when using existing beds. - Child from 5 to under 12 years of age is charged directly at hotel upon check-in for breakfast when using existing beds.